Coding Brains Client Reviews, Rating and Analysis Report. Coding Brains is a Top Mobile App, Product, and Web Development Company. We program in USA time Zone 8:00 am PST top 6:00 PM PST and have Proficient Team of 80+ Developers and Designers. Great English Speaking is just our another Skill Set. Our Project Managers are Leading Experts in respective Technologies. The Client is a serial entrepreneur in Real estate and Construction industry. We helped him to build several products to automate and provide information to mid size to large size contractors. The Client is one of the most successful Traders published on Forbes, Money Now. We helped to support and build several products and maintain his website. It is great to work with Coding Brains. They are very reliable and hard working guys. The best part being they worke in California Time which made the whole project a very pleasant experience. Excellent Company. Skilled and knowledgeable Programming, very happy with the results. I encouraged the developer to ask questions throughout the project as I wanted to ensure that there were no issues waiting to be addressed. When i needed them to respond, they would not via email. Their phone numbers either had a full voicemail box or would not be a working line. They finally informed us that they prefer to communicate via Skype. At first, they were responsive but again, that faded. They did not fulfill all of the requirements of the project but because of the long overdue delivery and in fear of not receiving the source code for the approximately 50% complete website, we paid them and I finished the project myself. I would not recommend Coding Brains' services based on my experience and hopefully, will not be forced to work with them again. Coding Brains is a fantastic company to work with. They finished the project on time and the finished product exceeded our expectations. Great communication throughout and they also helped us to troubleshoot and workout details to make the design better. Looking forward to working with them again in the future. Highly recommend! 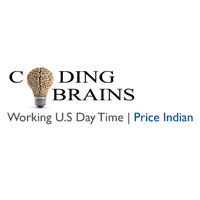 Coding Brains provides professional, prompt service and very good solutions to problems I face in my ecommerce business. I wish I would have requested their services sooner.